Know Exactly what you are getting!!! The Honeydew Green Melon is the classic green honeydew – sweet and delicious. Excellent by itself, in salads, or in desserts. 100 Survival Seeds. The Banana Melon is so-called because it looks more like a large banana than a cantaloupe. It’s a fascinating and unusual melon, with a hint of banana taste and aroma. 100 Survival Seeds. Honey Rock Melon or Honey Rock Cantaloupe –A former All-America winner. This melon produces unusually large melons that typically weigh as many as 7 pounds each. Very sweet taste. 100 Survival Seeds. Its name doesn’t lie. Tendersweet Orange Watermelons produce lovely oblong fruit with stunningly beautiful and incredibly delicious orange flesh. But Tendersweet Orange is more than a novelty; in our opinion we feel it can hold its own in a taste test with any more conventional watermelon. We highly recommend this one! 50 Survival Seeds. Sugar Baby is the ideal watermelon for the home gardener that wants big taste with limited space. 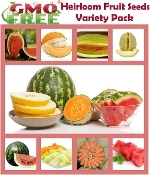 This variety is extremely popular with new and experienced watermelon growers. Sugar Baby is easy to grow from seed, and tends to be an abundant producer. 50 Survival Seeds.